Good Morning!! How are you today? I have a really fun project to show you today using Aurora Wings- Lady of the Forest. Isn't she just gorgeous?! I am not gonna lie to you this image is tricky and takes so long to color but the end result is simply stunning!!! And then when you turn it into a finished piece of art: LOOK OUT!!! We will sing and bless this place." I chose Shakespeare for a few reasons: #1 Shakespeare is all class to me. I always think of elegance and sophistication when I think of Shakespeare. #2 This image had me thinking of A Midsummer Night's Dream the whole time I colored it. 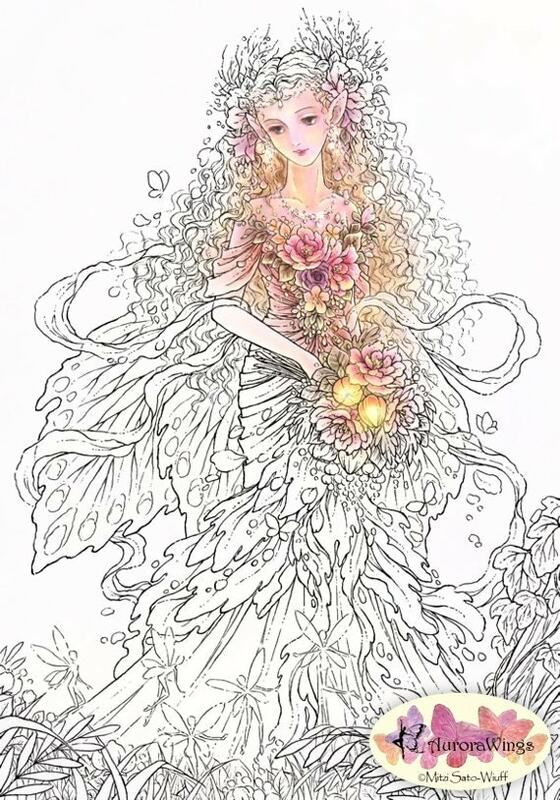 This Lady of the Forest reminds me of Titania the Queen of the Fairies in the play. #3 This specific quote was chosen because it spoke to me of what I think fairies are; peaceful, gentle and good spirited. This frame is a gift for a coworker for her birthday and I love the idea that this Lady of the Forest will bless her home. And there you have my project for this week!! Thanks so much for coming by to take a look! I cannot wait to see all the classy things you create!! Someone make a candle for me k? I love the idea I just am terrified to try myself!! LOL Make sure you post whatever awesome-ness you create in the challenge at Aurora Wings Challenge Blog! !